FitnessSyncer Stream shows you all of your health and fitness information in a consolidated stream view. Each item will show the Key Metrics for the activity. The title of the activity may have a link to further information, such as your map, lap, or sleep information, or a link to the originator’s website or links to export and download GPX, TCX, KML, KMZ, PWX, or FIT files. 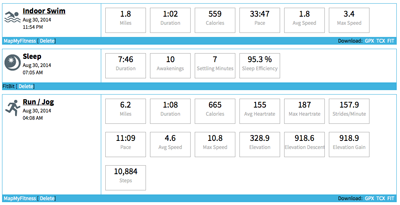 Split data, available in 0.1, 0.5, 1, 5, and 10 mile or kilometer increments. For Activity items, Pro users can reorder the charts (preference is not saved) and can see correlated Glucose data. Ability to edit Comments, Tags, and certain meta data such as activity type, title, measurement contexts, meals, etc. You can control the imperial or metric setting and time zone of the display on the Stream on your Profile.